Good Paste. Advance 1 quart warm water - dissolve in it 1 teaspoon alum. When cold stir in flour to the consistency of thick cream - then add as much powdered rosin as will lay upon a dime, & throw in half a dozen cloves to give a pleasant odor. Have on the fire a teacup of boiling water - pour the flour mixture into it stirring well all the time. It will soon be of the consistency of mush. Pour it in an earthen of china vessel - let it cool lay a cover on, & put it in a cool place. When needed for use, take out a portion & soften it with warm water, Paste thus made will last 12 months. It is better than gum, as it does not gloss the paper, & can be written on. Chlorine water. 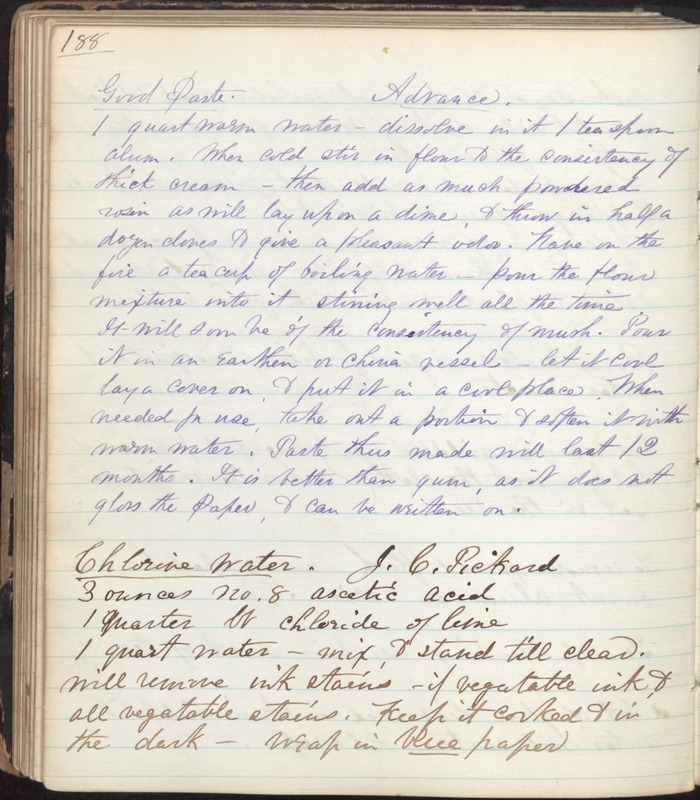 J.C. Pickard 3 ounces no.8 ascetic acid 1 quarter lb chloride of lime 1 quart water - mix, & stand till clear. will remove ink stains - if vegetable ink, & all vegetable stains. Keep it corked & in the dark - wrap in blue paper.